Both Rachael Ray and Giada have done their versions of this pasta. I did my own--sort of a cross between both of theirs, and I added spinach for flavor and a burst of color. It's easy, uses many of the ingredients you already have in your kitchen, and quick to make. Cook pasta separately. Reserve 1 cup of starchy cooking water. Saute garlic, shallots/onions in EVOO. Toss Shrimp and Spinach along with remaining ingredients, cook until shrimp is pink. 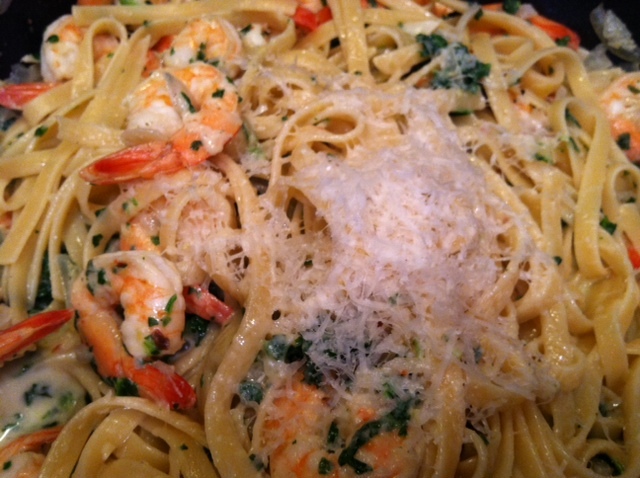 Combine pasta with Shrimp/Spinach, add 1/2 cup parmesan reggiano, combine well. Top with more parmesan reggiano to serve. Note: This isn't the best picture, but I had to hurry and take the picture as hungry kids stood over me waiting anxiously with plates in hand.